My name is Rob McKenzie, and I am a Level 3 judge and the Regional Coordinator for the USA-North Region. You can see the map of the region up above, but for those not from the US, the states in the region are North Dakota, South Dakota, Minnesota, and Wisconsin. I also do work as part of the Exemplar Program reviewing nominations and collecting address so foils can be shipped. This last weekend, I was head judge of the 903 player Modern SCG Open in Indianapolis. This is a commonly sideboarded card in Modern, and is probably going to come in from your draft sideboard in Modern Masters 2017 on more than one occasion. Grafdigger’s Cage prevents a handful of mechanics and cards extraordinarily well. In the format it originally existed in, the big mechanics it was designed to hose were undying and flashback, things that revolved around the graveyard. Undying forces the creature to go to the graveyard before it comes back, and flashback specifically casts the spell from the graveyard, both of which get a “no sir” from the Cage. Goryo’s Vengeance returns a card directly from a graveyard, which is disallowed, and Jace, Telepath Unbound’s -3 is also specifically not something you can do – the card is cast from the graveyard. Basically, it stops you from taking many cards from the graveyard and doing something with them – no reanimation, and no casting things. Grafdigger’s Cage is also pretty bad for people using the unearth mechanic on cards like Hellspark Elemental. You can totally pay the unearth cost of creature cards in your graveyard, but the creature won’t be returned. The Cage also has another bit, though. It prevents creatures coming into play from libraries or spells being cast from libraries. That’s…weird. Does that happen much? As it turns out, yes! Dryad Arbor is also in an interesting space. You can try to use a fetchland to get Dryad Arbor with a Grafdigger’s Cage out, but it won’t be able to enter the battlefield. I would suggest you never try, and just choose a different land. 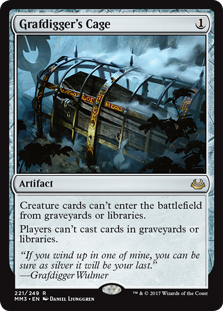 Likewise, you can’t play the Arbor from your library with Courser of Kruphix or from your graveyard with Crucible of Worlds. You aren’t casting the land, but you would be putting it into play from a graveyard or library, so it is not allowed. Grafdigger’s Cage also does some strange things. I alluded to one above, with Oath of Druids. The way Oath of Druids works, it reveals cards from the top of the library until it hits a creature card, puts the noncreature cards into the graveyard, and would normally put the creature onto the battlefield…but the Cage says otherwise. The creature card is still in the library, and it stays there, on top of the library. It behaves similarly with Proteus Staff (leaving the creature card on top) and if you Polymorph with a Grafdidgger’s Cage out, you are essentially shuffling the creature into its owner’s library. Grafdigger’s Cage also mostly stops Future Sight. You can play lands from the top of your library (other than Dryad Arbor), but you can’t cast any of the spells you see there. There is a deck that comes and goes in Modern popularity based around using the cascade mechanic to cast a Living End. Grafdigger’s Cage fails to prevent any part of this. First, cascade exiles the cards off the top of the library, and has you cast the card from exile. Because the spell is cast from exile, the Cage is totally fine with it. Second, Living End first exiles all the creatures in the graveyard, kills the creatures on the battlefield, then puts the creatures it exiled onto the battlefield. Because the creatures are being put onto the battlefield from exile, it is totally A-OK. There are a number of cards that behave in similar ways – I had a really clever question about Grafdigger’s Cage and Bring to Light this weekend. Bring to Light exiles the card it finds and has you cast it from exile, which the Cage does not stop, just like above. That’s about what I got. If you have questions, comments, or want to know more, I’ve started a discussion thread about this on the /r/mtgjudge subreddit that you can stop by in. Thanks for reading!